You only get one birthday day a year so it’s important you make the most of it. 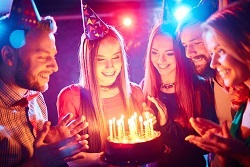 There’s a fair few things to consider if you want to make this year’s birthday the best it can be, so here’s the best guide to planning your birthday party. First you need to make sure the timing is right. Birthdays can come at the most inconvenient times. Our hearts go out to those of you with a birthday on a Monday. Ugh. Not to worry though, you don’t have to celebrate your birthday on the actual day, at least not the main event. If you’ve got a birthday on a workday you can always just go out for a meal after work and save the real party for the weekend before or after your birthday. We highly recommend doing this as it ensures most if not all the guests will be able to show. Build your own birthday weekend package here. Next on the list is the venue. Of course, you’ll want a venue that’s best suited to the activities you’ll be doing. It’s perfectly possible to have a fantastic birthday party at home. There’s a variety of awesome mobile birthday party activities for you to try. You could get a massage, take part in a life drawing class or even hire a personal bartender, all in the comfort of your own home, cottage or apartment. If you live for the nightlife our birthday party packages will get you a hotel room in a city centre location, a stone’s throw away from all the bars and clubs. Our hotels are well established chains like Jurys Inn, Premier Inn, Holiday Inn and Ramada hotels. The third and most important part of the list is getting yourself organised. You need to dish out the invites, sort out the budget and so on. The My Events VIP Area on our website is great for sorting out big birthday parties by making things simple and clear. It’s a got a number of useful features like individual payments (to avoid any awkward arguments over who owes what), group emails & invites, an online itinerary with venues and phone numbers and much more. If you’re partying on a budget then there’s a number of affordable but no less fun activities out there, like paintballing, escape rooms or the smartphone pub treasure hunt. See all our activities here and give us a call on 0161 341 0052 if you have any questions.